We've had had several enquiries recently about whether we could recommend some club-friendly iPad apps. Having done some investigating, this is what we found out. Which apps use the camera? 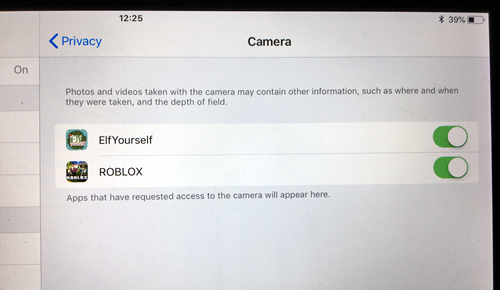 When browsing through the App Store, it’s not particularly easy to see which apps could access the camera when downloaded onto your iPad. Anything that offers on-line multiplayer or on-line chats, is likely to want to access the camera (but not necessarily). Don’t assume that apps/games which are rated age 4+ are off-line only or won’t request use of the camera. In Settings scroll down to Privacy. In Privacy scroll down to Camera. In Camera there should be a list of all the apps that have requested access to the camera. Next to each app is a little button. If you click the button to off (white) then that app can no longer access the camera. We therefore recommend that you always check the Camera settings on your iPad after you have downloaded an app, and make sure that all the buttons are set to 'off'. We discovered a great website, called Common Sense Media, which recommends apps, games, websites and books for children. It has reviews from parents and from children to help you decide if a game is right for you. It lists apps according to age group, which is really useful, and they also list apps which don’t require internet access, which could be very helpful in the context of an out of school club setting.